Enter your email address to subscribe to Locally Grown and receive notifications of new posts by email. This week’s newfound return to the LG blogisphere has yielded an interesting development: You aren’t nearly as interested in reading about Agriculture here as you are witnessing my tirades towards food critics, food bloggers, and dim-witted diners. The numbers don’t lie, and lucky for you I have a forthcoming opportunity to write about sustainable dining on another furum, freeing the “LG Brand” up for more constant crappy commentary and policing of those in the dining community whom need policed. To this end I thank you. Coming back to this blog was not easy, and there was consideration given to tranforming into a voice for positive change in local, sustainable food. This would have been a giant work load involving interviewing, research, and late nights making sure that every word is just just right, so as to most effectively pass the point of each post. Thank you for not making me do that here (I will let you whom want to read my writings on those subjects know where to read said articles once we get started). Yesterday while I was sitting at one of my favorite wifi spots having a liquid lunch and writing about farmers, I spied the mighty (thin) Des Moines Register, home of our favorite critical Francophile. You may recall that the LG posts of the prior two days dealt with the DD and her narrowly waving Magic Food Scene Judgement Wand passing um…judgement on the kitchens of Our Fair City and their inability to serve any desserts which aren’t cheesecake or “chocolate fall -down cake,” which I took to mean that lovely “worn out” dessert the Chocolate Lava Cake. The front page of the Living section, or whatever it is called, has a feature on desserts…and what is dessert #2 of the feature? CHOCOLATE LAVA CAKE FROM ALBA. AND IT IS BEING CAST IN A FAVORABLE LIGHT. Wait, what? How can this be? Have Jason and his team at Alba (who are all awesome, btw) somehow ressurected what was earlier in the week deemed one of the two most boring and tired desserts in all of MetroLand? on the third day the lava cake arose from its tired tomb to bring forth new light unto post-dining patrons. More later. My WP app is making this a very unpleasant experience. Thank you again, tens, for showing me what you REALLY want to read about. Who Are Your Heroes? Mine Are Farmers. A person who is admired for courage or noble qualities. Our society is based on a “hero mentality,” with us commoners daydreaming about those who would be there to save us from whatever evils would befall us. There are movie and comic-book (sorry, graphic novel) based super heroes with otherworldly powers saving puny humans from natural disasters, historical bad guys, and other super people whom have chosen to live a life of utter evil. There are every day heroes like doctors and nurses and the mortal humans whom keep you healthy and safe. There are even celebrity heroes such as Steven Tyler, whom work diligently to save you from having to listen to the wrong singing talent on your television. Thanks, ST. These heroes all serve their purpose in life, from stopping your gaping bleeding wounds, to saving your sanity, to keeping your house from burning to the ground, to just simply giving you hope that giant flying magnetically charged creatures from another dimension will not be descending upon your city to devour or enslave its population. 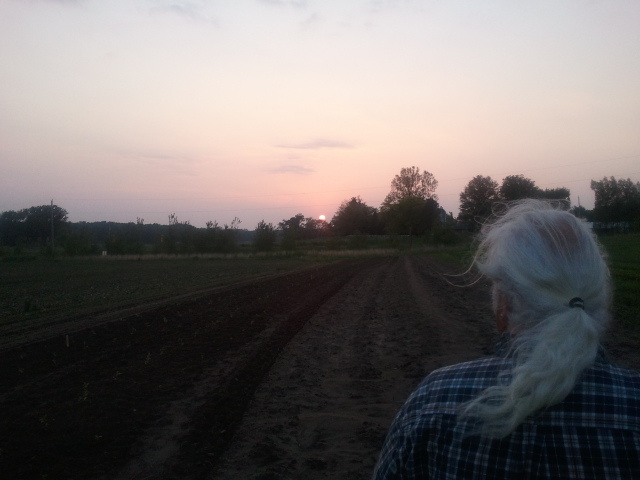 Larry Cleverley of Cleverley Farms in Mingo, Iowa watching the sun set over the farm. Larry is a real hero. But who are the real heroes of our lives? The people raising the food you (should) be eating. There is really no more noble, humble, or courageous a profession than to be a farmer. A real farmer, someone concerned with the well-being of not their bank accounts or the happiness of corporate overlords, but with the health of the land they farm and the people being fed from that land, and of the welfare of the community surrounding their farm. Does this make you hungry? Because THIS is what makes me hungry. Today’s rant isn’t supposed to be some wildly informative treatise on local sustainable farming/food, but just to get you in that mindset. Spring is around the corner and we will be talking more in the near future about ways to enrich your lives through these heroes of agriculture.